The Wilson Access team demonstrated how the hydraulically adjustable tracks and variable jacking options make them ideal for working on gradients and how, because they are light in weight, they allow for minimum ground pressure, making them perfect for enabling works on various rough terrains from parks and patios to forests and woodland. 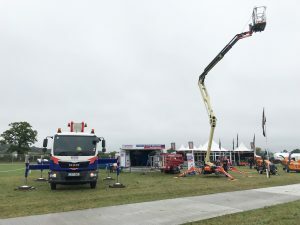 The demonstrations resulted in the immediate sale of a Hinowa Lightlift 23.12 machine, atracked access platform that offers a maximum working height of 23.2m and a horizontal outreach of up to 11.4m. Next Three Komatsu PC210LCD-11’s with elevated cabs for Ridgway Rentals.